The Staplehurst rail crash was a railway accident at Staplehurst, Kent, England, which took place on 9 June 1865 and in which ten passengers were killed and 40 injured. It is particularly remembered for its effects on the novelist Charles Dickens, who was travelling as a passenger in a front, first class carriage on the boat train returning from France, with his companions Ellen Ternan and her mother. The track was in the process of being renovated at Staplehurst, at a spot where the rails ran over a low cast iron girder bridge over the River Beult. The timing of the train, the Folkestone Boat Express, varied with the tides which governed the arrival of ships at the port. The foreman had mistakenly thought that the train would arrive later than it did, and the final two rails had not been replaced. The foreman had posted a lookout, but he was not far away enough to give adequate warning to the fast approaching train. Detonators should have been placed on the rails as an additional safeguard, but they were missing. The investigator, Colonel Rich, later reckoned that the train was travelling at about 30 mph when it entered the bridge. It managed to reach the far side of the viaduct by moving on the timber baulks supporting the rails, but the cast iron girders below cracked, and most of the carriages fell into the small brook (the River Beult) under the viaduct. The viaduct was not protected by guard rails, or any form of balustrade to prevent carriages overturning. The poor design of the viaduct contributed significantly to the disaster, and was to presage future calamities. This profound experience affected Dickens psychologically for the rest of his life. He became a public hero for his efforts in helping the dying and injured passengers. He wrote a short story some time after the accident, a ghost story called "The Signal-Man", in which one of the principal incidents is a rail in a tunnel. Though Dickens possibly based his fictional crash upon the events of the terrible and well-known Clayton Tunnel accident of 1861 (23 dead, 176 injured), rather than the Staplehurst crash, it is reasonable to suppose that his personal involvement in the Staplehurst incident inspired the harrowing tale. But he also included a fatal fall from a train and the signalman's own demise, as foretold by a spectre who appears to him before every accident. Dickens was deeply affected by the experience, and was extremely nervous when travelling by train; he tried to avoid train travel, using alternative means when available. It is also reasonable to suppose that the psychological effects and anxiety of the crash helped to shorten his life; he died five years to the day after the accident. The accident is used as part of the plot in R. F. Delderfield's Swann saga novel - God is an Englishman. It also forms the starting point in a novel by Dan Simmons - Drood - published in February 2009. 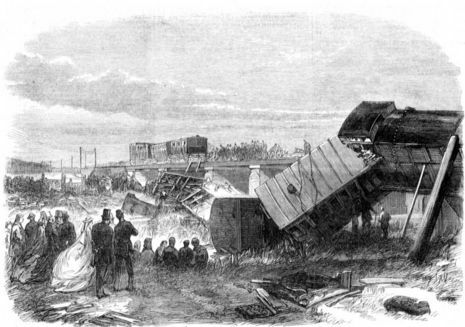 "The most disastrous accident which has ever happened on the South-Eastern Railway" was how the newspapers described the events of the afternoon of 9 June 1865, when the Folkestone to London Boat Train "The Tidal Express" with 110 passengers on board, was derailed near Staplehurst at "a very common bridge, with no wall whatever to protect it, and underneath it, at a depth of about twelve feet, runs a sluggish stream". The bridge had been under repair for some three months and the last part of the work required the replacement of two large beams which supported the rails. Two lengths of rail had been removed and the work gang of platelayers and carpenters were about their business when the unfortunate accident transpired. Normally you would expect this type of repair to be completed without incident but in this case a set of fatal circumstances occurred. The Folkestone to London Boat Train did not run at the same time each day, the time it left Folkestone was dependant upon the tides and the arrival of the cross-channel ferry from Boulogne. If the timetable were read incorrectly it could mean up to an hour's difference in the train's anticipated arrival. Whilst the 9 June was a Friday, the Foreman of the work gang (Henry Benge) had apparently read the time for the Saturday train! In addition Benge, although a requirement of his appointment as Foreman, himself carried no watch to tell the time of the trains, although a number of men within the gang had their own watches. A "flagman" was placed about 500 yards up the track to warn of any approaching trains although none were expected! The line at Staplehurst is a long straight piece of track and the engine pulling the Boat Train was one of the most powerful that the South-Eastern Railway had at that time, the Boat Train was also non-stop to Redhill and the combination of these three points meant that it was travelling at full speed between 40 and 50 mph. The train itself comprised fourteen vehicles - seven first class carriages, three second class, the engine, tender, brake and luggage vans.